Original fastin diet pills were popular as a prescription medication for obesity as their active ingredient was phentermine, which is an appetite suppressant. But how exactly does fastin work? Phentermine is a nervous system stimulant. It affects your hypothalamus and puts your body in an over stimulated condition elevating your blood pressure and speeding up your heart beat. This will suppress your appetite and prevent you from over eating. 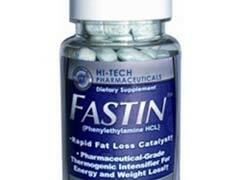 New formulations of fastin diet pills are popular as weight loss supplements and do not contain phentermine. The company that markets new fastin pills did not update the customers about the new formulation of the pills. Therefore, it’s important to consult with your doctor as to safety while taking these pills. Some of the ingredients in the new formula of fastin can act as fat burners for women and men. The fastin reviews appear to be mixed. If you want to buy the original fastin, you should look for ingredients listing when you are purchasing. 1. As with any drug, phentermine fastin diet pills can cause allergic reactions. Although severe allergic reaction is rare, consult a doctor immediately if you notice rash, itching or swelling (face/throat/tongue), difficulty breathing and severe dizziness. 2. Dizziness, dry mouth, nausea, vomiting, diarrhea or constipation, sleeping problem are some of the common side effects. If the side effects persist, consult a doctor. 3. Phentermine can also cause heart and lung problems (sometimes fatal). The risk increases when it’s taken with other appetitive suppressants. If you have chest pain, difficulty breathing, swelling of feet or legs and weakness of muscles, you should consult a doctor immediately. Drinking alcohol might also increase the risk of certain side effects. 4. As with any stimulant abuse, one of the side effects of over using the pills is addiction. Hence, be careful not to go beyond the prescribed amount. There are also other safer alternatives for losing weight such as b12 injections for weight loss, especially if you follow a vegetarian diet. Vitamin b12 can boost your metabolism and provide you with energy for exercise and physical activity. Adipex Vs Phentermine Diet Pills - Which One Is Better?